IMPORTANT: The "System Requirements", "File Info", "Download", and "Install" sections relate to the USB storage device update procedure. Ignore them if you completed the update using the “Automatic software download” feature. For FAQ and other helpful information, visit your model page on the Sony Support Site. Download the update file to your computer. Click the [Download] button on the bottom of the page to download the update file on your computer. Verify that the size of the "sony_tvupdate_2015_5433_nab_auth.zip" file is "1 560 835 755" bytes. NOTE: For Windows computer, verify the "Size" instead of "Size on disk" on the Properties screen. NOTE: After you extracted the downloaded file, you will find the file "sony_dtv0FA50A09A0A9_00014300_153900b7.pkg". Insert the USB storage device into your computer. 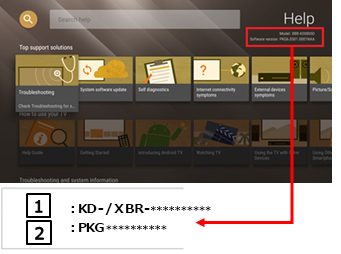 Copy or drag and drop the file "sony_dtv0FA50A09A0A9_00014300_153900b7.pkg" to the root directory of your USB device. Insert your USB storage device containing the file "sony_dtv0FA50A09A0A9_00014300_153900b7.pkg" into a USB port of the TV. Once the USB storage device has been detected, a series of different messages will appear on the TV. Follow the on screen instructions. NOTE: If the version number is "PKG5.433.xxxx", the software update was successful. If it isn't, download and install the update again. Turn off the TV by pressing the [POWER] button on the TV. If the message "No newer version of the TV software was found" is displayed, your TV already has newest software version installed.